Validated Against This exam has been written for the Java SE 8 release. - Create executable Java applications with a main method; run a Java program from the command line; including console output. - Compare and contrast the features and components of Java such as: platform independence, object orientation, encapsulation, etc. - Develop code that uses wrapper classes such as Boolean, Double, and Integer. 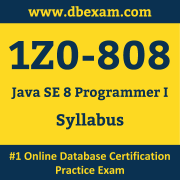 - "Recognize common exception classes (such as NullPointerException, ArithmeticExcpetion, ArrayIndexOutOfBoundsException, ClassCastException)"
The Oracle 1Z0-808 Certification Program certifies candidates on skills and knowledge related to Java products and technologies. The Oracle Certified Associate Java SE 8 Programmer is granted based on a combination of passing exams, training and performance-based assignments, depending on the level of certification. Oracle 1Z0-808 certification is tangible benchmark of experience and expertise that help you stand out in a crowd among employers. To ensure success, Oracle recommends combining education courses, practice exam and hands-on experience to prepare for your Java SE 8 Programmer I certification exam as questions will test your ability to apply the knowledge you have gained in hands-on practice or professional experience.